Group Rhodes, the advanced engineering company is celebrating relocating to new premises in Wakefield, investing in refurbishing and re-equipping its new manufacturing facility and creating 21 new jobs. The new site is only half a mile from where the business was founded in 1824. The company, which designs, manufactures and services machinery for the clay preparation, metalworking and materials handling industries, has invested £800,000 in its new premises, equipment and its infrastructure, including new heating and extraction systems, office equipment, new electrics and IT systems, mezzanine floors and production machinery. In addition, Group Rhodes successfully secured a Leeds City Region LEP (Local Enterprise Partnership) grant of £70,000, which helped to create the new roles. The roles include CNC machine operators, service engineers, production support personnel, design engineers, sales engineers and a Quality Health and Safety and Environmental (QHSE) Manager. Over the past 12 months, the company has also invested in its service fleet, with eight new commercial vehicles acquired, taking the total investment in the business over the last 12 months to over £1m. 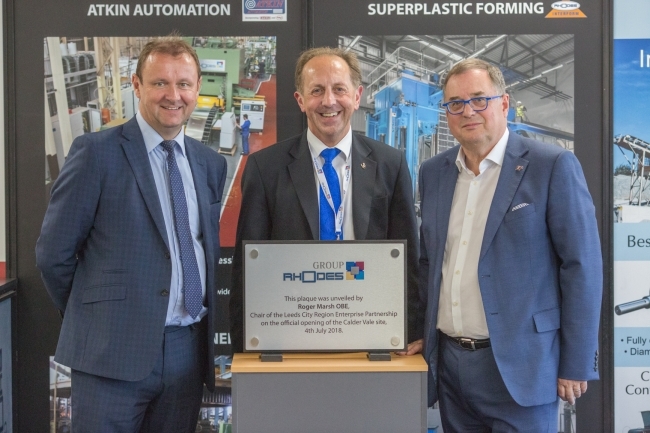 To celebrate the move, Group Rhodes held an Open Day, which consisted of a factory tour for around 200 customers, suppliers and other stakeholders, followed by a presentation by Mark Ridgway, CEO of Group Rhodes and the official opening. Speakers at the event included Richard Halstead, EEF Membership Engagement Director, North, who spoke about the importance of manufacturing to the UK, and Roger Marsh discussed the regional economy before unveiling a plaque to officially open the site. Mark Ridgway, CEO of Group Rhodes, in his address to guests, spoke about the importance of innovation in an increasingly fragmented global marketplace. The Open Day gave delegates the opportunity to learn more about Group Rhodes’ products and recent installations. They were also able to take advantage of 3D visualisation technology to gain an insight into Group Rhodes’ future designs and there were video presentations on British manufacturing. The relocation and investment has significantly improved the operational environment for both office and production staff at Group Rhodes. The factory environment is much lighter and more modern and the office layout allows the different commercial divisions of the company to work more closely together. The new layout should have benefits for customers too, allowing Group Rhodes to offer improved cover for technical enquiries, telephone support and service provision, with engineers regularly supporting other divisions, as necessary. The group’s new IT systems also provide better communication between factory and offices, with the intention of real time mapping of production flows. Group Rhodes is focused on innovation and new product development, with new technologies being explored and patents developed. The company currently has a patent pending on a device to enhance the processing of lightweight alloys at high temperatures and has also recently submitted a bid alongside several of the country’s leading universities to develop a means of designing, proving, optimising and industrialising ongoing and nascent metalforming processes.